Christmas time is upon us and comes with the wonderfully fun adventure of shopping for all of our favorite pudgy toddler faces! My goal when shopping for the kids is to focus toys that encourage imagination and learning through play – the fewer batteries the better with a few exceptions. The Pit. You can use a shallow water pool but this ball pit is built just for the balls. Keeps the kids and the balls contained while keeping them safe if they crawl out. Boys and girls alike can spend hours of fun playing in this Ball Pit. Brightly colored polka dot design for added excitement. Features airy mesh sides for added visibility. This six side playpen for balls has been the highlight of my kids month! Bright and fun looking filled with balls it just screams to be played in. I have it filled with 200 balls (see below), that is enough, but 400 would be better and more fun especially for the older kids – 600 if you are the best grandma ever. Easily folds up into a tiny 9″ carry case for storage and transportation. The Balls. Below is a short video review covering the balls specifically. These are smaller, thinner and lighter than the ones you might be familiar with in commercial spaces. Some parents don’t like them because they are less durable. I prefer them because when your kid throws them at your head, they don’t hurt 🙂 This is the pack of the 200 balls. Comes in a real mesh bag that closes for easy cleanup and storage. 200 balls perfectly fills the bottom of the ball pit above. Durable, have a little squish to them. The balls and ball pit were sent to me free by the manufacturer for my honest review and opinions. Listing here on my blog as a suggested gift all on my own because this toy rocked! Recieved right before my daughter broke her leg and this was a blessing as it enabled her to play and the toys were never too far away. This wooden activity center is packed full of exciting features! Includes 4 quadrants with a variety of activities: 6 tracks with animal-themed gliders, 6 bead runs with colorful wooden beads, a spring flower and more. 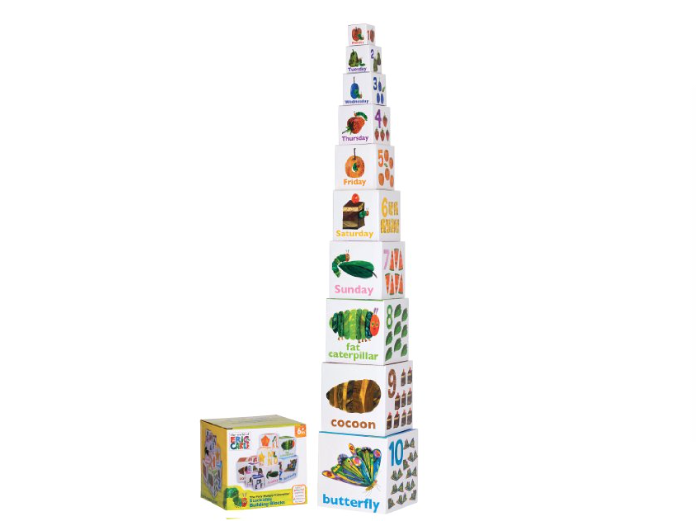 Eric Carle Stacking/Nesting Blocks. Includes 10 paperboard blocks. Stacks to 34 inches high! These Nesting Blocks offers hours of hue-riffic learning for children three years old and up. Each block represents a different animal, and all but the birds has a different tactile or movable feature. The pairing of animals with numbers is subtle but clever. Parents will appreciate the words used to describe an action of each animal: peacock yelping, flamingo fluting, walrus bellowing. The ten paperboard blocks are illustrated with all the characters from the author’s books so toddlers will recognize their favorite characters too. What I love is that they are very similar to the nesting blocks used at my son’s montessori program and encourage learning in a self guided play. This is priced on the very high end of what I would normally consider as a gift, but after seeing it in action at a birthday party – IT IS AWESOME! It is an animatronic, life-size baby dinosaur stands over 3 feet tall and comes to “life” with realistic sounds and motion! Responds to your voice and touch with roaring and laughing sounds, and expressive tail, head, eye, mouth and horn movements. Loaded with cutting-edge animatronics features, Kota is a lifelike pet from the past. Kota will quickly become your preschooler’s best friend, and his realistic features will leave kids in awe! 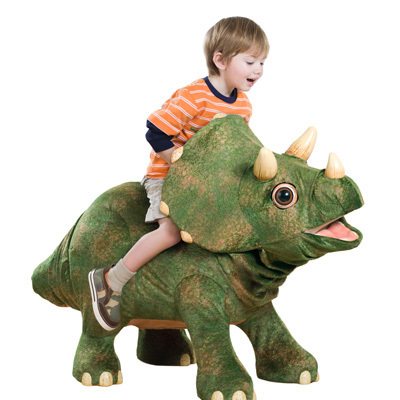 Measuring over 40″ long, tots can sit on Kota for some rompin’ stompin’ dino adventures. A hidden handle and spring-loaded seat provide a fun and safe ride. Kota’s tail, head, eyes, horns and mouth are animated, and he comes with a fun music mode so riders can trounce along to dino songs. When he’s hungry, kids can feed him special leaves and he’ll be happy. A little smaller than I expected, but this makes it the perfect pick for toddler hands when you are looking to give them a toy to be “just like dad” – or in my house – “just like mom!”. My favorite part is that there is a little switch on the underside that starts the “saw” up when you touch a surface so it is like you are really sawing. Nice little surprise. Needs two AA batteries to operate – not included. Toy is light weight but made of a pretty strong plastic material, not flimsy which is what I expected. I received this toy in return for my honest review – I have actually held it in my hand, played mith my son and watched him give it a good beating.